Of course, you can blame your loudspeakers (or at least, the people that made them). You could blame the acoustical behaviour of your listening room (that could be expensive). You could blame the format that you chose when you bought the recording (was it 128 kbps MP3 or a CD?). Or, if you’re one of those kinds of people, you could blame the quality of the AC mains cable that provides the last meter of electrical current supply to your amplifier from the hydroelectric dam 3000 km away Or you could blame the people who made the recording. In fact, if the recording quality is poor (whatever that might mean) then you can stop worrying about your loudspeakers and your room and everything else – they are not the weakest link in the chain. So, this week, we’ll talk about who those people are that made your recording, how they did it, and what each of them was supposed to look after before someone put a CD on a shelf (or, if you’re a little more current, put a file on a website). 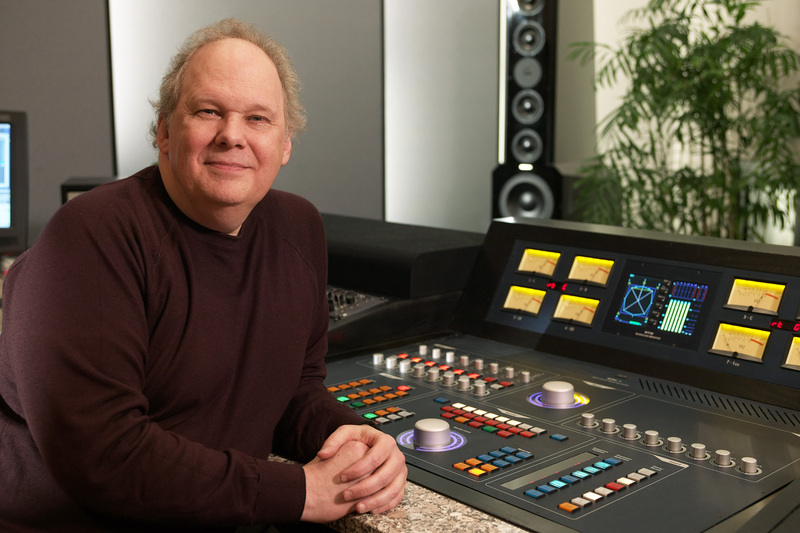 The recording engineer is the person you picture of when you think about a recording session. You have the musicians in the studio or the concert hall, singing and playing music. That sound travels to microphones that were set up by a Recording Engineer who then sits behind a mixing console (if you’re American – a “mixing desk” if you’re British) and fiddles with knobs obsessively. Fig 1. A recording engineer (the gentleman on the right) engineering a recording. This is actually probably a staged shot – but it could easily have been taken either during the tracking or mixing part of the process. There’s a small detail here that we should not overlook. Generally speaking, a “recording engineer” has to do two things that happen at different times in the process of making a recording. The first is called “tracking” and the second is called “mixing”. Normally, bands don’t like playing together – sometimes because they don’t even like to be in the same room as each other. Sometimes schedules just don’t work out. Sometimes the orchestra and the soloist can’t be in the same city at the same time. In order to circumvent this problem, the musicians are recorded separately in a process called “tracking”. During tracking, each musician plays their part, with or without other members of the band or ensemble. For example, if you’re a rock band, the bass and the drummer usually arrive first, and they play their parts. In the old days, they would have been recorded to seaport tracks on a very wide (2″!) magnetic tape (hence the term “tracking”) where each instrument is recorded on a separate track. That way, the engineer has a separate recording of the kick drum and the snare drum and each tom-tom and each cymbal, and so on and so on. Nowadays, most people don’t record to magnetic tape because it’s too expensive. Instead, the tracks are recorded on a hard disc on a computer. However, the process is basically the same. Once the bass player and the drummer are done, then the guitarist comes into the studio to record his or her parts while listening to the previously-recorded bass and drum parts over a pair of headphones. Then the singer comes in and listens to the bass, drums and guitar and sings along. Then the backup vocalists come in, and so on and so on, until everyone has recorded their part. During the tracking, the recording engineer sets up and positions the microphones to get the optimal sound for each instrument. He or she will make sure that the gain that is applied to each of those microphones is correct – meaning that it’s recorded at a level that is high enough be mask the noise floor of the electronics and the recording medium, but not so high that it distorts. In the old days, this was difficult because the dynamic range of the recording system was quite small – so they had to stay quite close to the ceiling all the time – sometimes hitting it. Nowadays, it’s much easier, since the signal paths have much wider dynamic ranges so there’s more room for error. In the case of a classical recording, it might be a little different for the musicians, but the technical side is essentially the same. For example, an orchestra will play (so you don’t bring in the trombone section first – everyone plays together) with a lot of microphones in the room. Each microphone will be recorded on its own individual track, just like with the rock band. The only difference is that everyone is playing at the same time. Fig 2. A typical orchestra recording session. Note that all the musicians are there, and there are a lot of microphones in the room. Each of those microphones is probably being recorded on its own independent track on a hard disc somewhere so that they can be mixed together later. Once all the tracking is done the musicians are finished. They’ve all been captured, each on their own track that can be played back later in isolation (for example, you can listen to just the snare drum, or just the microphone above the woodwind section). Sometimes, they will even have played or sung their part more than once – so we have different versions or “takes” to choose from later. This means that there may be hundreds of tracks that all need to be mixed together (or perhaps just left out…) in order to make something that normal people can play on their stereo. Now that all the individual tracks are recorded, they have to be combined into a pretty package that can be easily delivered to the customers. This means that all of those individual tracks that have been recorded have to be assembled or “mixed” together into a version that has, say, only two channels – one for the left loudspeaker and one for the right loudspeaker. This is done by feeding each individual track to its own input on a mixing console and listening to them individually to see how they best fit together. This is called the “mixing” process. During this stage, basic decisions are made like “how loud should the vocals be relative to the guitars (and everything else)”. However, it’s a little more detailed than that. Each track will need its own processing or correction (maybe changing the equalisation on the snare drum – or altering the attack and decay of the bass guitar using a dynamic range compressor – or the level of the vocal recording is changed throughout the tune to compensate for the fact that the singer couldn’t stay the same distance from the microphone whilst singing…) that helps it to better fit into the final mix. Fig 3. A mixing console that has been labelled with the various tracks for the input strips. This is a very typical look for a console during a mixing session – although the surroundings are not. If you walk into the control room of a recording studio during a mixing session, you’d see that it looks almost exactly like a recording session – except that there are no musicians playing in the studio. This is because what you usually see on videos like this one is a tracking session – but the recording engineer usually does a “rough mix” during tracking – just to get a preliminary idea of how the puzzle will fit together during mixing. Once the mixing session for the tune is finished, then you have a nearly-finished product. You at least have something that the musicians can take home to have a listen to see if they’re satisfied with the overall product so far. In classical music there is an extra step that happens here. As I said above, with classical recordings, it’s not unusual for all the musicians to play in the same room at the same time when the tracking is happening. However, it is unusual that they are able to play all the way through the piece without making any mistakes or having some small issues that they want to fix. So, usually, in a classical recording, the musicians will play through the piece (or the movement) all the way through 2 or 3 times. While that happens, a Recording Producer is sitting in the control room, listening and making notes on a copy of the score. Each time there is a mistake, the producer makes a note of it – usually with a red make indicating the Take Number in which the mistake was made. If, after 2 or 3 full takes of the piece, there are points in the piece that have not been played correctly, then they go back and fix small bits. The ensemble will be asked to play, say 5 bars leading up to the point that needs fixing – and to continue playing for another 5 bars or so. Later, those different takes (either full recordings, or bits and pieces) will be cut and spliced together in a process called editing. In the old days, this was done using a razor blade to cut the magnetic tape and stick it back together. For example, if you listen to some of Glen Gould’s recordings, you can hear the piano playing along, but the tape hiss changes suddenly in the background noise. This is the result of a splice between two different recordings – probably made on different days or with different brands of tape. Nowadays, the “splicing” is done on a computer where you fade out of one take and fade into another gradually over 10 ms or so. Fig 4. A “crossfade” on a modern digital audio workstation. The edit point (what used to be a “tape splice”) is where the recording on the top right is faded out and a different recording (bottom right) of the same music is faded in. If the editing was perfect, then you’ll never hear that it happened. Sometimes, however, it’s possible to hear the splice. For example, listen to this recording and listen to the overall level and general timbre of the piano. It changes to a quieter, duller sound from about 0′ 27″ to about 0´ 31″. This is a rather obvious tape splice to a different recording than the rest of the track. The final stage of creating a recording is performed by a Mastering Engineer in a mastering studio. This person gets the (theoretically…) “finished” product and makes it better. He or she will sit in a room that has very little gear in it, listening to the mixed song to hear if there are any small things that need fixing. For example, perhaps the overall timbre of the tune needs a little brightening or some control of the dynamic range. Another basic role of the mastering engineer is to make sure that all of the tracks on a single album sound about the same level – since you don’t want people sitting at home fiddling with the volume knob from tune to tune. When the mastering engineer is done, and the various other people have approved the final product, then the recording is finished. All that is left to do is to send the master to a plant to be pressed as a CD – or uploaded to the iTunes server – or whatever. In other words the Mastering Engineer is the last person to make decisions about how a recording should sound before you get it. This is why, when I’m talking to visitors, I say that our goal at Bang & Olufsen is to build loudspeakers that perform so that you, in your listening room, hear what the mastering engineer heard – because the ultimate reference of how the recording should sound is what it sounded like in the mastering studio. The title of Recording Producer means different things for different projects. Sometimes, it’s the person with the money who hires everyone for the recording. Sometimes (usually in a pop recording) it’s the person sitting in the control room next to the recording engineer who helps the band with the arrangement – suggesting where to put a guitar solo or where to add backup vocals. Some pop producers will even do good ol’ fashioned music arrangements. A producer for a classical recording usually acts as an extra set of ears for the musicians through the recording process. This person will also sit with the recording engineer in the control room, following the score to ensure that all sections of the piece have been captured to the satisfaction of the performers. He or she may also make suggestions about overall musical issues like tempi, phrasing, interpretation and so on. The basic procedure for film mixing is the same – however, the “mixing engineer” in a film world is called a “re-recording engineer”. The work is similar, but the name is changed. A tonmeister is a person who can act simultaneously as a Recording Engineer and a Recording Producer. It’s a person who has been trained to be equally competent in issues about music (typically, tonmeisters are also musicians), acoustics, electronics, as well as recording and studio techniques. Hi Geoff, thanks for the overview – appreciate that! The part on the ‘Mastering Engineer’ did come a bit short, I think. What a mastering engineer does, actually is very important for what we hear afterwards. Would have liked to hear more about how different masters are made for different purposes (vinyl, ‘radio mixes’, cd/red book standart, highres (or even Blu Ray Audio), iTunes versions….). In that sense it is not unimportant, which version we choose for listening to on our ‘well-tuned B&O gear’. Often – in current music – you have the impressions that the mastering engineer makes things (the ‘finished’ version) worse (you wrote ‘make things better’) – think of heavy dynamic compression and more. The role of the record companies for what we will hear afterwards, is very important too – since they are the guys, who pay the saleries! Maybe that is what you mean with ‘various other people’? As to how different masters are made – this is a good question! Many times, there are no differences. Of course, when things are “re-mastered” – it might mean many things (usually more dynamic range compression). This is something that I should think about writing – especially the different requirements when mastering for vinyl vs. digital. Although there must be a good article about that topic somewhere out there in the world of pro audio magazines. I’ll dig around to see if there’s something worth reading. Where great sound starts – earfluff and eyecandy is a little vanilla. viewers to click. You might try adding a video or a related pic or two to grab people interested about everything’ve written. In my opinion, it would bring your blog a little bit more interesting.